NEWSFLASH: Caterpillar, the construction equipment giant, has just reported results — and Wall Street isn’t happy. Caterpillar has warned that it is facing “supply chain challenges across the industry”. Raw material costs have also jumped, it warns, partly due to increased steel prices and other tariffs introduced since Donald Trump was elected. Manufacturing costs were higher due to increased material and freight costs. Material costs were higher primarily due to increases in steel prices and tariffs. Freight costs were unfavorable primarily due to supply chain inefficiencies as the industry continues to respond to strong global demand. Caterpillar says that recently imposed tariffs cost it around $40m in the last quarter, a concrete sign that the trade war is hurting US companies. On the upside, Caterpillar narrowly beat profit expectations in the last three months. It made $2.88 per share, ahead of forecasts of $2.72, while revenues jumped by 18% year-on-year to $13.5bn. “This was the best third-quarter profit per share in our company’s history. Shares have fallen by over 6% in pre-market trading. enltr“This was the best third-quarter profit per share in our company’s history,” said Caterpillar CEO Jim Umpleby Tuesday. In further gloomy news, UK manufacturers have reported the sharp fall in orders since the EU referendum. The CBI, which represents Britain’s bosses, reports that new orders at UK factories fell at the fastest pace in three years in the last quarter. Firms are also more pessimistic about business prospect, particularly about their chances of selling goods abroad. “This is a sobering set of figures demanding immediate action at home and abroad. “Planned investment is being scaled back in the face of deepening Brexit uncertainty, so it’s vital that the Chancellor incentivises manufacturers to spend in areas that will help them become more productive. Using the upcoming Budget to increase the Annual Investment Allowance, alongside a wider review, could help the UK become more competitive with its global peers. 10% of firms said they were more optimistic about the general business situation than three months ago and 25% were less optimistic, giving a rounded balance of -16%, the fastest decline since July 2016. Optimism about export prospects for the year ahead deteriorated at the fastest pace since 2012 (-15% down from -2% in July). 27% of firms said the volume of output over the past three months was up and 14% said it was down, giving a balance of +13%, up from +11% in the quarter to September. 21% of businesses reported an increase in new orders, and 28% reported a decrease, giving a rounded balance of -6%, the weakest balance since October 2015. Domestic orders (-10%) and export orders both fell (-8%), a weaker reading than in the previous quarter (+8% and +21% respectively). No wonder the FTSE 100 is falling. UK investor morale has hit its lowest level in at least 23 years, according to financial services firm Hargreaves Lansdown. Its Investor Confidence Index has fallen to 53 this month, from 58 in October – its lowest level since it began in 1993. It has averaged 92 over the last decade, but just 69 over the last 12 months. If this index is right, it means the City is more downbeat than during the 2008 financial crisis. ‘Investors are in grim mood, as time is running out on Brexit negotiations with little progress on show. Sentiment was dented by the financial crisis, but not to the extent we are seeing today. That’s perhaps because the crisis unfolded in an unscheduled fashion, while the timeline on the UK’s withdrawal from the EU is there for all to see. A looming early Budget and a stormy October on the markets will do little to settle nerves. Over in Ankara, Turkey’s president has told its parliament that the murder of Jamal Khashoggi was a premeditated and meticulously planned political assassination. Recep Tayyip Erdogan vowed to pursue the investigation into Khashoggi’s death, calling on Riyadh to hand over those responsible. Here’s a link to our liveblog. enltrErdogan calls on Saudi Arabia to hand gang responsible for Khashoggi violent murder to be tried in Istanbul. Asks Riyadh to identify “the local collaborator” that it alleges dumped his body. Adds no-one believes a small group planned killing. Who sent gang to Istanbul, he asks. enltrPresident Erdogan: “Pinning such an incident on a few security and intelligence officials satisfies neither us nor the international community. But Erdogan did not release any significant new details about the killing. So the Saudi stock market has shaken off its early slump, and is now up on the day. Here are the best and worst performers on the FTSE 100 today, as the index wallows at a seven-month low. Newsflash: Britain’s FTSE 100 has slid to a new seven-month low, as world stock markets extend today’s losses. The Footsie is now down 82 points at 6,959, its lowest level since the end of March this year. The smaller FTSE 250, which contains medium-sized companies, has slumped by 1.8% or 350 points.. The slump is being led by technology stocks, miners, energy firms and industrial companies. Ingredients bobbing in the cauldron include…. The unresolved US-China trade war (and fears about the latter’s economy), the US withdrawal from the INF Treaty, the Khasohoggi-related friction between the West and Saudi Arabia, Brexit (all of it, but specifically the rising chances of a no deal divorce), and, perhaps most pertinent to Tuesday, the ongoing EU-Italy budget dispute. A calamitous cavalcade of market concerns, of such seriousness that it is a surprise the global indices ever manage to edge into the green. The futures market is indicating a bad start on Wall Street later today. The Dow is now expected to drop by over 1%. Newsflash: Britain’s technology company Dyson has decided to build its first electric car in Singapore. The company has chosen Singapore over the UK, as it prepares to get the vehicle on the road in 2021. The electric car is being designed and tested at Hullavington Airfield in Wiltshire, in western England, but will be manufactured almost 7,000 miles away. Dyson says it chose Singapore due to the “international nature” of its operations. It already employs around 1,100 people in Singapore, where it makes electric motors. Our existing footprint and team in Singapore, combined with the nation’s significant advanced manufacturing expertise, made it a frontrunner. Singapore also offers access to high-growth markets as well as an extensive supply chain and a highly skilled workforce. Singapore has a comparatively high cost base, but also great technology expertise and focus. It is therefore the right place to make high quality technology loaded machines, and the right place to make our electric vehicle. Fifteen years ago, Dyson was criticised for moving washing machines production from Wiltshire to Malaysia. Today’s decision feels like another blow to UK manufacturing. Dyson, though, points out that its total UK headcount has increased by 2.5 times over the last five years to 4,800. It is currently spending £200m on new buildings and testing facilities at Hullavington. Dyson is truly global in its development, delivery and realisation of technology. This decision is good news for the exceptional teams we have in both the UK and Singapore. Saudi Arabia still expects to sign tens of billions of dollar of deals at its investment conference, despite those high-profile withdrawals following Jamal Khashoggi’s death. Saudi Arabia brushed off an outcry over the killing of journalist Jamal Khashoggi and went ahead on Tuesday with an investment conference boycotted by Western political figures, leading international bankers and company executives. Speaking at the opening session, prominent Saudi businesswoman Lubna Olayan said the killing of the Washington Post columnist was “alien to our culture” and voiced confidence that the kingdom will “emerge stronger”. Saudi Arabia, the world’s largest oil exporter, is expected to sign deals worth more than $50 billion in the oil, gas, industries and infrastructure sectors on the opening day with companies including Trafigura, Total, Hyundai, Norinco, Schlumberger, Halliburton and Baker Hughes. Hundreds of bankers and company executives joined officials at a palatial Riyadh hotel for the Future Investment Initiative, an annual event designed to help attract billions of dollars of foreign capital as part of reforms to end Saudi dependence on oil exports. WSJ reporter Rory Jones says the Saudi investment conference is underway – despite scores of big names pulling out. The high-profile pull-outs from the FII include JP Morgan’s Jamie Dimon, the head of the IMF, Christine Lagarde, Glencore chairman Tony Hayward and many more – even Uber’s boss, Dara Khosrowshahi, despite the PIF’s $3.5bn investment in his company. Separately, Richard Branson has suspended the Gulf state’s $1bn investment in his space project, Virgin Galactic. Rarely have so many business leaders been seen running in the same direction, in this case away from Saudi Arabia at speed. All of this deals considerable damage to the public profile of a man who was meant to be the standard-bearer for reform and modernisation. When MBS was in California on his tour, he hired out most of the Four Seasons hotel in Beverly Hills, enjoying lunches with Rupert Murdoch, rubbing shoulders in Silicon Valley with the likes of Facebook boss Mark Zuckerberg and schmoozing film stars. In another blow to Saudi Arabia, Japanese billionaire Masayoshi Son has abandoned plans to speak at its Future Investment Initiative (FII), which started today. Michael Amon of the Wall Street Journal reports that Son may still be present, but he won’t be on the stage. enltrBREAKING: Softbank’s Masayoshi Son won’t speak at FII, event spokesman says. He could show up on the sidelines. enltrSon is arguably Saudi Arabia’s closest foreign investment partner. His cancellation came long after other CEOs abandoned ship and shows how serious the #khashoggi crisis is for Saudi. Saudi Arabia’s stock market has also dropped in early trading, down 1.2%. Traders will be worrying about Riyadh growing isolation following Jamal Khashoggi’s murder, and the prospect of Turkey releasing the “naked truth” about the killing later today. “I am not satisfied with what I’ve heard. Trump’s Treasury secretary, Stephen Mnuchin, has cancelled his appearance at Saudi Arabia’s investment conference – but he did met with crown princeMohammed bin Salman yesterday. MBS – who had billed himself as a social and economic reformer – had built close ties with Washington, particularly with Trump’s son-in-law, Jared Kushner. Now, though, he facing intense pressure over the Khashoggi case, with many analysts concluding that he authorised the killing. Several of his close aides have been arrested or dismissed. enltrTo make clear @stevenmnuchin1 cancelled his speaking engagement at Saudi investment conference. He is in Saudi (as part of 6 country Middle East trip) visiting the Terrorist Financing Targeting Center and having meetings in preparation for Iran sanctions. enltrIn his meeting with the Saudi Crown Prince, @stevenmnuchin1 addressed combating terrorist financing, implementing Iran sanctions, Saudi economic issues and the Khashoggi investigation. Mike van Dulken of Accendo Markets points out that the US stock market fell yesterday, helping to trigger t oday’s losses in Asia and now Europe. The negative opens come after Asia’s rally cooled, retracing Monday’s jump amid fresh fears about global trade, geopolitical tensions and the US midterm elections. Wall Street added to downbeat sentiment with banks and financials leading the slide as worries mount over the strength of earnings from the remainder of corporates set to report. Boom! As feared, European stock markets have slumped to their lowest point in almost two years. Germany’s DAX dropped 1.35% in early trading, France’s CAC and Spain’s IBEX both lost 1%, and Italy has shed 0.8%. This has hauled the Euro Stoxx 600 index down to its lowest point since December 2016. Naeem Aslam of Think Market s fears it will be a tough day, possibly dominated by worries about Italy. Geopolitical tensions, Italian budget woes and the ongoing standoff between the European Commission and Italy are making investors nervous. Given that there is no solution about the trade war between the US and China stand is making things a bit more arduous today. We need to have a solution to the Italian budget. Investors are going to keep a close eye on the European Commission’s decision today about the Italian budget. The commission may end up doing something which is unprecedented- it may ask Italy to revise and resubmit its budget. It is widely expected that the commission is going to have a negative opinion about the budget, but the question is if Italy will be ready to comply with the request? The Italian banking sector could be the primary trade here because if the Italian bond spread touched the 400 basis points, it is going to create a lot of trouble for the sector. The bond spread has already touched a five-year high of 341 basis points on Friday. Ouch. Britain’s blue-chip stock index has fallen close to an eight-month low at the start of trading. Today’s selloff has pushed stocks across Asia to the brink of a bear market (more than 20 percent off their recent highs. MSCI Asia Pacific Index has dropped to its lowest since May 2017, with losses across the region. 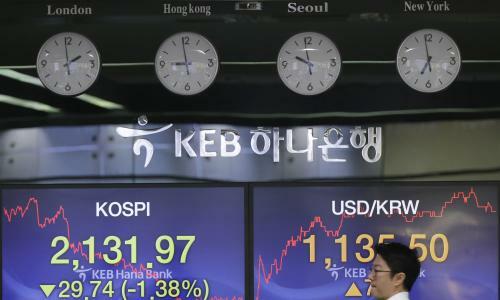 Among the steepest decreases were in Japan, Hong Kong and China, where shares had had the biggest jump in more than two years Monday. Global equities as measured by the MSCI World Index face their worst month since August 2015. S&P 500 Index futures declined 1% and Euro Stoxx 50 contracts opened more than 1% lower, indicating the rout will spread to U.S. and European markets. The yen gained and gold ticked higher. Pessimism is gripping the global markets this morning, as investors fret about a clutch of economic and geopolitical issues. The budget row between Italy and the EU, Brexit, the brutal killing of Saudi critic Jamal Khashoggi, and America’s withdrawal from the In termediate-Range Nuclear Forces nuclear treaty with Russia are all creating angst on the trading floors today. The lack of progress in the US-China trade dispute isn’t helping either. Asian markets have already been hit, with Japan’s Topix index sliding by 2.6% and Hong Kong losing 3%. China, which surged by over 4% yesterday on hopes of a government stimulus, has handed back half those gains today. Markets remain shrouded in “a thick blanket of risk today” as investors fear shares could take a tumble, says Stephen Innes, head of Asia-Pacific trading for foreign exchange firm OANDA. The US dollar outperformed on Monday on the back of Italy and Brexit risk while the mere utterance of a protracted equity correction remains a highly sensitive topic that investors fear could morph from a wall of worry into a towering wall of pain. Risk aversion continues to permeate every pocket of the markets whether triggered by President Trump’s latest tweets on immigration or the blustery headwinds from Riyadh to Rome; markets remain shrouded in a thick blanket of risk. European market are expected to take a jolt when trading begins shortly. Traders will be watching to see if Brussels orders Rome to rewrite its 2019 budget, which currently contains a deficit target of 2.4% of GDP. Turkish president Recep Tayyip Erdogan is due to release more details about Khashoggi’s death in the Saudi consulate at Istanbul, in a speech later today. With international condemnation mounting, Saudi have now called the killing a “tremendous mistake” and launched an investigation. Riyadh is also pushing on with a major investment summit, starting today, but many business leaders have already pulled out. IG predict that the FTSE 100 will drop close to a seven-month low, while European markets could hit levels last seen in late 2016.
https://gu.com/p/9m799 false true https://media.guim.co.uk/7faf53708f37e2f479613541abc5909f9bba52e7/0_115_4067_2441/500.jpg false en Caterpillar’s results also show that consumers are paying the price of Donald Trump’s trade disputes: NEWSFLASH: Caterpillar, the construction equipment giant, has just reported results — and Wall Street isn’t happy. Caterpillar has warned that it is facing “supply chain challenges across the industry”. Raw material costs have also jumped, it warns, partly due to increased steel prices and other tariffs introduced since Donald Trump was elected. It says: Manufacturing costs were higher due to increased material and freight costs. Material costs were higher primarily due to increases in steel prices and tariffs. Freight costs were unfavorable primarily due to supply chain inefficiencies as the industry continues to respond to strong global demand. Caterpillar says that recently imposed tariffs cost it around $40m in the last quarter, a concrete sign that the trade war is hurting US companies. On the upside, Caterpillar narrowly beat profit expectations in the last three months. It made $2.88 per share, ahead of forecasts of $2.72, while revenues jumped by 18% year-on-year to $13.5bn. Caterpillar CEO Jim Umpleby says: “This was the best third-quarter profit per share in our company’s history. Our global team continues to do excellent work focusing on our customers’ success and executing our strategy for profitable growth.” Shares have fallen by over 6% in pre-market trading. In further gloomy news, UK manufacturers have reported the sharp fall in orders since the EU referendum. The CBI, which represents Britain’s bosses, reports that new orders at UK factories fell at the fastest pace in three years in the last quarter. Firms are also more pessimistic about business prospect, particularly about their chances of selling goods abroad. Rain Newton-Smith, chief economist at the CBI, says: “This is a sobering set of figures demanding immediate action at home and abroad. “Planned investment is being scaled back in the face of deepening Brexit uncertainty, so it’s vital that the Chancellor incentivises manufacturers to spend in areas that will help them become more productive. Using the upcoming Budget to increase the Annual Investment Allowance, alongside a wider review, could help the UK become more competitive with its global peers. Here’s more details from the CBI’s industrial trends report: 10% of firms said they were more optimistic about the general business situation than three months ago and 25% were less optimistic, giving a rounded balance of -16%, the fastest decline since July 2016. Optimism about export prospects for the year ahead deteriorated at the fastest pace since 2012 (-15% down from -2% in July). 27% of firms said the volume of output over the past three months was up and 14% said it was down, giving a balance of +13%, up from +11% in the quarter to September. 21% of businesses reported an increase in new orders, and 28% reported a decrease, giving a rounded balance of -6%, the weakest balance since October 2015. Domestic orders (-10%) and export orders both fell (-8%), a weaker reading than in the previous quarter (+8% and +21% respectively). No wonder the FTSE 100 is falling. UK investor morale has hit its lowest level in at least 23 years, according to financial services firm Hargreaves Lansdown. Its Investor Confidence Index has fallen to 53 this month, from 58 in October – its lowest level since it began in 1993. It has averaged 92 over the last decade, but just 69 over the last 12 months. Brexit is the top issue worrying investors, while wider global instability is another concern pushing the index down: If this index is right, it means the City is more downbeat than during the 2008 financial crisis. Laith Khalaf, senior analyst at Hargreaves Lansdown, says the constant drip-feed of Brexit news has drenched investors in gloom: ‘Investors are in grim mood, as time is running out on Brexit negotiations with little progress on show. Sentiment was dented by the financial crisis, but not to the extent we are seeing today. That’s perhaps because the crisis unfolded in an unscheduled fashion, while the timeline on the UK’s withdrawal from the EU is there for all to see. A looming early Budget and a stormy October on the markets will do little to settle nerves. These are challenging times for investors who are faced with a significant known unknown in the form of Brexit. In such circumstances, it’s worth falling back on the basics of investing. That means taking a long term perspective, keeping diversified, and drip feeding money into the markets to take advantage of any dips.’ Over in Ankara, Turkey’s president has told its parliament that the murder of Jamal Khashoggi was a premeditated and meticulously planned political assassination. Recep Tayyip Erdogan vowed to pursue the investigation into Khashoggi’s death, calling on Riyadh to hand over those responsible. Here’s a link to our liveblog. Importantly, Erdogan appeared to absolve the Saudi leader while not mentioning crown princeMohammad Bin Salman, saying: “I do not doubt the sincerity of King Salman. That being said, independent investigation needs to be carried out. This is a political killing” But Erdogan did not release any significant new details about the killing. So the Saudi stock market has shaken off its early slump, and is now up on the day. Here are the best and worst performers on the FTSE 100 today, as the index wallows at a seven-month low. Newsflash: Britain’s FTSE 100 has slid to a new seven-month low, as world stock markets extend today’s losses. The Footsie is now down 82 points at 6,959, its lowest level since the end of March this year. The smaller FTSE 250, which contains medium-sized companies, has slumped by 1.8% or 350 points.. The slump is being led by technology stocks, miners, energy firms and industrial companies. Connor Campbell of SpreadEx blames a “poisonous brewing cauldron of geopolitical and economic issues” [which sounds even scarier than this morning’s ‘thick blanket of risk’] Ingredients bobbing in the cauldron include…. The unresolved US-China trade war (and fears about the latter’s economy), the US withdrawal from the INF Treaty, the Khasohoggi-related friction between the West and Saudi Arabia, Brexit (all of it, but specifically the rising chances of a no deal divorce), and, perhaps most pertinent to Tuesday, the ongoing EU-Italy budget dispute. A calamitous cavalcade of market concerns, of such seriousness that it is a surprise the global indices ever manage to edge into the green. The futures market is indicating a bad start on Wall Street later today. The Dow is now expected to drop by over 1%. Newsflash: Britain’s technology company Dyson has decided to build its first electric car in Singapore. The company has chosen Singapore over the UK, as it prepares to get the vehicle on the road in 2021. The electric car is being designed and tested at Hullavington Airfield in Wiltshire, in western England, but will be manufactured almost 7,000 miles away. Dyson says it chose Singapore due to the “international nature” of its operations. It already employs around 1,100 people in Singapore, where it makes electric motors. Jim Rowan, CEO of Dyson says: Our existing footprint and team in Singapore, combined with the nation’s significant advanced manufacturing expertise, made it a frontrunner. Singapore also offers access to high-growth markets as well as an extensive supply chain and a highly skilled workforce. Singapore has a comparatively high cost base, but also great technology expertise and focus. It is therefore the right place to make high quality technology loaded machines, and the right place to make our electric vehicle. Fifteen years ago, Dyson was criticised for moving washing machines production from Wiltshire to Malaysia. Today’s decision feels like another blow to UK manufacturing. Dyson, though, points out that its total UK headcount has increased by 2.5 times over the last five years to 4,800. It is currently spending £200m on new buildings and testing facilities at Hullavington. In a letter to staff, Rowan says: Dyson is truly global in its development, delivery and realisation of technology. This decision is good news for the exceptional teams we have in both the UK and Singapore. Saudi Arabia still expects to sign tens of billions of dollar of deals at its investment conference, despite those high-profile withdrawals following Jamal Khashoggi’s death. Reuters explains: Saudi Arabia brushed off an outcry over the killing of journalist Jamal Khashoggi and went ahead on Tuesday with an investment conference boycotted by Western political figures, leading international bankers and company executives. Speaking at the opening session, prominent Saudi businesswoman Lubna Olayan said the killing of the Washington Post columnist was “alien to our culture” and voiced confidence that the kingdom will “emerge stronger”. Saudi Arabia, the world’s largest oil exporter, is expected to sign deals worth more than $50 billion in the oil, gas, industries and infrastructure sectors on the opening day with companies including Trafigura, Total, Hyundai, Norinco, Schlumberger, Halliburton and Baker Hughes. Hundreds of bankers and company executives joined officials at a palatial Riyadh hotel for the Future Investment Initiative, an annual event designed to help attract billions of dollars of foreign capital as part of reforms to end Saudi dependence on oil exports. We’re live-blogging president Erdogan’s speech on Jamal Khashoggi’s death, here: WSJ reporter Rory Jones says the Saudi investment conference is underway – despite scores of big names pulling out. My colleague Rob Davies points out that a string of big names have resisted the chance to mix with crown prince MbS: The high-profile pull-outs from the FII include JP Morgan’s Jamie Dimon, the head of the IMF, Christine Lagarde, Glencore chairman Tony Hayward and many more – even Uber’s boss, Dara Khosrowshahi, despite the PIF’s $3.5bn investment in his company. Separately, Richard Branson has suspended the Gulf state’s $1bn investment in his space project, Virgin Galactic. Rarely have so many business leaders been seen running in the same direction, in this case away from Saudi Arabia at speed. All of this deals considerable damage to the public profile of a man who was meant to be the standard-bearer for reform and modernisation. When MBS was in California on his tour, he hired out most of the Four Seasons hotel in Beverly Hills, enjoying lunches with Rupert Murdoch, rubbing shoulders in Silicon Valley with the likes of Facebook boss Mark Zuckerberg and schmoozing film stars. Plenty of other executives have shown up, though: In another blow to Saudi Arabia, Japanese billionaire Masayoshi Son has abandoned plans to speak at its Future Investment Initiative (FII), which started today. Michael Amon of the Wall Street Journal reports that Son may still be present, but he won’t be on the stage. Saudi Arabia’s stock market has also dropped in early trading, down 1.2%. Traders will be worrying about Riyadh growing isolation following Jamal Khashoggi’s murder, and the prospect of Turkey releasing the “naked truth” about the killing later today. Yesterday Donald Trump said he wasn’t happy with the response from Saudi Arabia, telling reporters: “I am not satisfied with what I’ve heard. We’re going to get to the bottom of it.” Trump’s Treasury secretary, Stephen Mnuchin, has cancelled his appearance at Saudi Arabia’s investment conference – but he did met with crown princeMohammed bin Salman yesterday. MBS – who had billed himself as a social and economic reformer – had built close ties with Washington, particularly with Trump’s son-in-law, Jared Kushner. Now, though, he facing intense pressure over the Khashoggi case, with many analysts concluding that he authorised the killing. Several of his close aides have been arrested or dismissed. Mnuchin’s spokesman, Tony Sayegh, has tweeted about the meeting: Mike van Dulken of Accendo Markets points out that the US stock market fell yesterday, helping to trigger today’s losses in Asia and now Europe. The negative opens come after Asia’s rally cooled, retracing Monday’s jump amid fresh fears about global trade, geopolitical tensions and the US midterm elections. Wall Street added to downbeat sentiment with banks and financials leading the slide as worries mount over the strength of earnings from the remainder of corporates set to report. Boom! As feared, European stock markets have slumped to their lowest point in almost two years. Germany’s DAX dropped 1.35% in early trading, France’s CAC and Spain’s IBEX both lost 1%, and Italy has shed 0.8%. This has hauled the Euro Stoxx 600 index down to its lowest point since December 2016. Naeem Aslam of Think Markets fears it will be a tough day, possibly dominated by worries about Italy. Geopolitical tensions, Italian budget woes and the ongoing standoff between the European Commission and Italy are making investors nervous. Given that there is no solution about the trade war between the US and China stand is making things a bit more arduous today. We need to have a solution to the Italian budget. Investors are going to keep a close eye on the European Commission’s decision today about the Italian budget. The commission may end up doing something which is unprecedented- it may ask Italy to revise and resubmit its budget. It is widely expected that the commission is going to have a negative opinion about the budget, but the question is if Italy will be ready to comply with the request? The Italian banking sector could be the primary trade here because if the Italian bond spread touched the 400 basis points, it is going to create a lot of trouble for the sector. The bond spread has already touched a five-year high of 341 basis points on Friday. Ouch. Britain’s blue-chip stock index has fallen close to an eight-month low at the start of trading. The FTSE 100 is down 51 points, or 0.8%, at 6991, close to its lowest level since April Today’s selloff has pushed stocks across Asia to the brink of a bear market (more than 20 percent off their recent highs. MSCI Asia Pacific Index has dropped to its lowest since May 2017, with losses across the region. Bloomberg has the details: Among the steepest decreases were in Japan, Hong Kong and China, where shares had had the biggest jump in more than two years Monday. Global equities as measured by the MSCI World Index face their worst month since August 2015. S&P 500 Index futures declined 1% and Euro Stoxx 50 contracts opened more than 1% lower, indicating the rout will spread to U.S. and European markets. The yen gained and gold ticked higher. Good morning, and welcome to our rolling coverage of the world economy, the financial markets, the eurozone and business. Pessimism is gripping the global markets this morning, as investors fret about a clutch of economic and geopolitical issues. The budget row between Italy and the EU, Brexit, the brutal killing of Saudi critic Jamal Khashoggi, and America’s withdrawal from the Intermediate-Range Nuclear Forces nuclear treaty with Russia are all creating angst on the trading floors today. The lack of progress in the US-China trade dispute isn’t helping either. Asian markets have already been hit, with Japan’s Topix index sliding by 2.6% and Hong Kong losing 3%. China, which surged by over 4% yesterday on hopes of a government stimulus, has handed back half those gains today. Markets remain shrouded in “a thick blanket of risk today” as investors fear shares could take a tumble, says Stephen Innes, head of Asia-Pacific trading for foreign exchange firm OANDA. The US dollar outperformed on Monday on the back of Italy and Brexit risk while the mere utterance of a protracted equity correction remains a highly sensitive topic that investors fear could morph from a wall of worry into a towering wall of pain. Risk aversion continues to permeate every pocket of the markets whether triggered by President Trump’s latest tweets on immigration or the blustery headwinds from Riyadh to Rome; markets remain shrouded in a thick blanket of risk. European market are expected to take a jolt when trading begins shortly. Traders will be watching to see if Brussels orders Rome to rewrite its 2019 budget, which currently contains a deficit target of 2.4% of GDP. Turkish president Recep Tayyip Erdogan is due to release more details about Khashoggi’s death in the Saudi consulate at Istanbul, in a speech later today. With international condemnation mounting, Saudi have now called the killing a “tremendous mistake” and launched an investigation. Riyadh is also pushing on with a major investment summit, starting today, but many business leaders have already pulled out. IG predict that the FTSE 100 will drop close to a seven-month low, while European markets could hit levels last seen in late 2016. The agenda 11am BST: CBI Industrial trends survey for October 11.30am BST: Bank of England chief economist Andy Haldane speaks at the launch of the OECD ‘New Approaches to Economic Challenges Lab’ seminar 17114 false false A foreign exchange dealing room in Seoul, South Korea. The London Stock Exchange in the City of London. Sir James Dyson. European stocks in early trading today European stock markets in early trading The FTSE 100 over the last 12 months A currency trader watches the computer monitors near the screens the foreign exchange rates at the foreign exchange dealing room in Seoul, South Korea.